This is my small home studio, half of a repurposed bedroom. For the past several years, my work has been primarily drawing with ink or markers. To the left of the drawing table are several rolls of large drawings, the fruit of time spent in other studios where I could work on drawings as large as 5 by 11 feet. The table is just big enough for a 22″ x 30″ sheet, a paper size I often use. If I want to work bigger at home during the winter, I’ll have to use the floor. Which is not necessarily a bad thing. There are subtle differences in the physical dynamics of working on a table, an easel, a wall, or a floor. 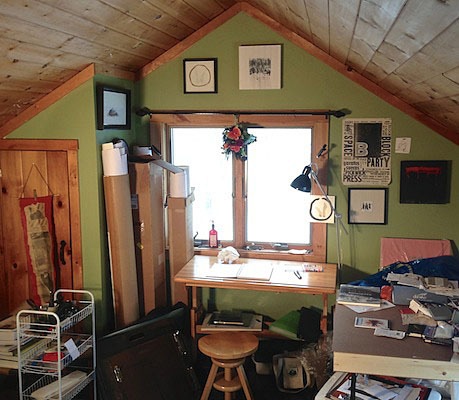 My studio is located in my home on the South Portland peninsula. I like painting amongst the salt air, working harbor, and sound of foghorns from Spring Point Light and Portland Head Light. This has been a welcome adjustment after living in New Jersey for the last 15 years, although I greatly miss being just 15 miles west of NYC. Luckily, when I find myself longing for the Garden State I can look out among the oil tanks and listen to the inbound jets flying directly over our house for subtle reminders of my former home. 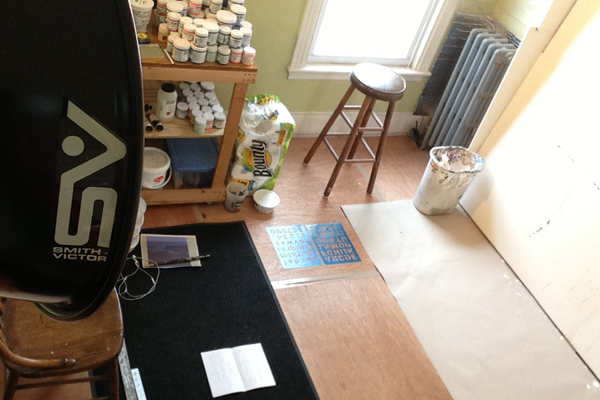 My studio is a room that I converted by laying plywood flooring and constructing a large white painting wall. I have a rolling cart that carries my pallet and my paints. Since my process involves a lot of sanding, I run an exhaust fan. I light my studio with two floodlights. Depending on the time of year, my process typically occurs in one of two ways. During warmer weather, I paint oil studies on site and return to the studio to create a larger painting based on the sketch. In the colder months, I work from reference photos on an iPad to create a graphite drawing and an oil sketch that establishes the composition and color palette. I also spend the winter months painting subjects like the figure and still life. If the painting is inspiring enough to me, a larger version is created. 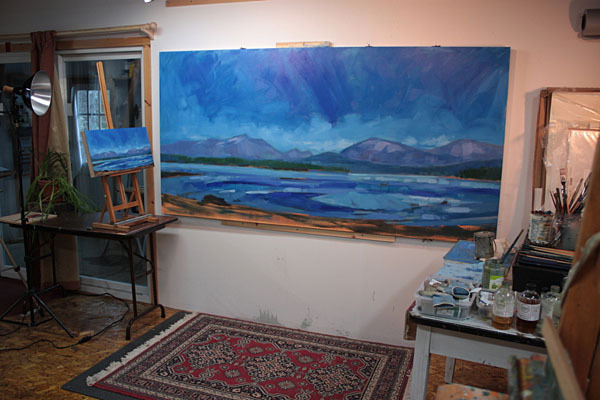 In this studio photo you can see the scaled version to the left of a larger (42 x 94 inches) commissioned oil painting in progress. Once the oil study is completed, any photographic reference is abandoned and the sketch becomes the “reference” to keep the painting fresh and alive.